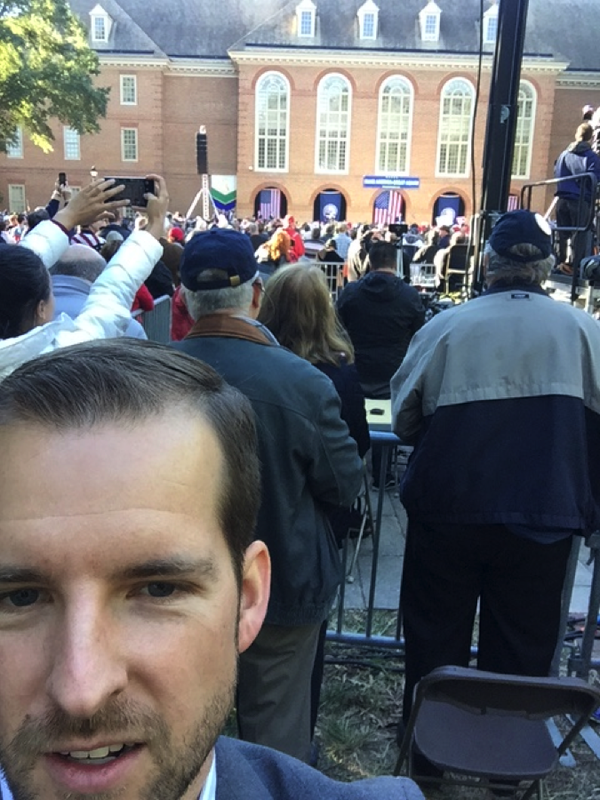 When I planned to attend the Conference on Faith and History’s October meeting at Regent University, one of the largest evangelical schools in the nation, little did I know that a Trump rally would break out. While most of us in the CFH claim some affiliation with evangelical Christianity, I was probably the only one giddily excited that the Secret Service forced us to move across campus to make way for Trump’s undisguised effort to keep Virginia’s white evangelicals in the fold. I skipped the last session of the conference – along with, come to find out, not a few of my colleagues – to see if I couldn’t get a firsthand look at Trumpism. I wasn’t disappointed. 1). Donald Trump was uncharacteristically restrained and his talk relatively uninteresting. Those who preceded him on stage, however, weren’t. With televangelist and Regent founder Pat Robertson leading things off, Ralph Reed of the Faith & Freedom Coalition, Tony Suarez of the National Hispanic Leadership Conference, and Virginia State Senator Frank Wagner pounded home a litany of classic evangelical touchstones, from abortion to Christian Zionism to religious liberty. Evangelical Christian values or Socialism. There, we were told, lies the battle for America’s soul. 2). That said, the Trump supporters I met were real people with real concerns. There’s no denying that we tend to run in circles made up of folk more or less like us, and this surely includes our political leanings. Still, I grew up in red Texas and in an especially conservative family – I don’t remember knowing a democrat until I got to graduate school – but I simply could not find a Trump supporter back home. Where were these supposedly millions of Trump supporters? I really wanted to know. And, what I found was that they were, well, rather normal. I don’t think there’s any denying that Trumpism, as a movement, has some valid concerns, and I’m hardly the first critic to say so. In various ways, these folks’ have been ignored as a constituency, even if much of what they’re saying can be disputed. They feel cast-off, if not taken advantage of, and that’s a feeling as old as America. 3). Trumpism isn’t going to go away, and certainly not any time soon. Again, I’m not the first to suggest as much. Trump’s political brilliance lies in the fact that he has discovered and stoked something much bigger than him. This was readily apparent at the rally, where the invective against Clinton, Capitol Hill, and the status quo drowned out whatever cheers there were for the real estate mogul (and there were plenty of those). It is also readily apparent in those recent, frightening threats to remove Hillary at any cost. The folk I stood next to in Virginia genuinely believed – to call it merely a “feeling” would be too weak – that Washington had not just ignored them; it had forsaken them. It took no time at all for things to get heated when a number of Trump supporters failed to make it into the rally before the gates closed, but it took even less time for them to start blaming Hillary and the corrupt political establishment for buying off that poor Secret Service agent who made the call to close the gates in the first place. So strong, in fact, was this anti-Washington sentiment that I wouldn’t be surprised if Trumpism continues its populist barrage even should Trump win tomorrow. Sometimes the fires we stoke outgrow our capacity to contain them. Needless to say, whatever happens on Tuesday, Trumpism isn’t going away. 4). And, that’s because Trump and his campaign aren’t the only conductors driving this train. That Trump came to Regent explicitly to court evangelicals highlights, at the very least, the strength of the Christian Right as a political and cultural bloc. And yet, while the evangelicalism we see supporting Trump is bigger (and more diverse) than just one presidential candidate, it also appears well encapsulated in this year’s race. Much has been made of the apparent hypocrisy of evangelicals actively supporting, if not campaigning, for a candidate who flouts their moral sensibilities. (Notably, I didn’t see anybody wearing the “Bomb the S— out of ISIS” shirts that were for sale at the entrances to the rally.) Indeed, many of us have wondered just what it would take to make these folk finally jump ship. Forget the Christian moral life. Forget abortion, drugs, war, crime, and even religious liberty – all common themes pounded by others from that political pulpit that afternoon and all ostensibly important issues for evangelicals, not to mention a pastor to millions of them. But, for Pat Robertson, what matters most about tomorrow’s election – indeed, what matters most about this candidate, this country, and this world – is our pocketbooks, and whether or not they’re going to grow or shrink. Sadly, that seems to be what Pat thinks his evangelical constituency cares most about, too.